Pharmacists are becoming more involved in dispensing medications for animals, including food producing animals. The educational curriculum for a pharmacist often does not include training for veterinary patients. The following provides important information for a pharmacist dispensing medications for food-producing animals. Currently, a food producing animal is defined by intention of use. Any animal or animal products, such as milk/eggs/honey, that are to be consumed by humans is considered to be a food-producing animal. Food-producing animals are categorized into major and minor species. A major species includes cattle, swine, chickens, and turkeys. A minor species is everything else besides a major species, such as sheep and goats. Species classes may further be categorized by production class, such as dairy cattle vs. beef cattle. More information on species classification can be found HERE and information on production class classification can be found HERE. While some clients may consider these species as pets and assure the animal will not enter the food chain, the future is unknown and it Is best to consider them as food producing animals. Therefore, it is in the best interest of the pharmacist to verify all required information, including a withdrawal interval, is included in a prescription for a food producing animal and to contact the prescribing veterinarian if there are any questions or missing information. Under the Animal Medicinal Drug Use Clarification Act (AMDUCA), the FDA can prohibit the extra label use of specific drugs or drug classes in certain species. To see the list of prohibited and restricted drugs in food-producing animals, click HERE. Use of a prohibited or restricted drug in a food producing animal is illegal and neither the treated animal nor its food products should enter the human food chain. In circumstances of prohibited ELDU, FARAD does not provide a withdrawal interval. A Veterinary Feed Directive, or VFD, is similar to a written prescription, except it is for use of medicated feed only. A VFD Order is a written statement from a licensed veterinarian that authorizes a client to obtain and use a VFD drug in or on animal feed in accordance with label directions. VFD's were enacted in January 2017 by the FDA as part of a multi-step approach to help combat antimicrobial resistance. It is important to note that extra label drug use of drugs in or on feed is prohibited by the FDA in food producing animals. In California, SB 27 was created to help combat antimicrobial resistance. It is similar to VFD by bringing veterinary oversight to medically important antimicrobials (MIA). Compared to a VFD, SB 27 extends veterinary oversight to all dosage forms of MIA, not just medicated feed. What this means is that MIA formulations that are designated OTC at the federal level are designated as Rx in the state of California. A list of these drugs can be found HERE. The Animal Medicinal Drug Use Clarification Act, referred to as AMDUCA, permits veterinarians to use FDA approved medications in an extra label manner under certain conditions. AMDUCA has specific stipulations for extra label drug use (ELDU) in food producing animals, including the necessity of a valid veterinary client patient relationship (VCPR) and for the extra label use to be for therapeutic purposes only. The details of AMDUCA's ELDU requirements can be found HERE. A withdrawal time is the period of time from when a drug is administered to when the drug concentration falls below the tolerance (the legally allowed concentration of a drug residue, established for individual tissues or other food products). Every approved livestock drug has a withdrawal time, which only applies when the drug is used according to the labeled directions (drug, species/production class, indication, dose, route of administration, frequency of administration, treatment duration). Having a labeled withdrawal time does not mean there will be no drug residue in the edible tissue or food product. It means that if there are residues, they will be at or below the established tolerance level. If a drug is used in any manner different from the label (ELDU), the withdrawal time is affected. For example, if a higher than labeled dose is used, it can dramatically change when the residue concentrations fall below the tolerance. Because of this, the only way a drug can legally be used extra label is when it is prescribed by a veterinarian, who must also issue an extended withdrawal interval. It is important for pharmacists to know that a prescription label for an extra label drug use requires an extended withdrawal interval, which must be determined by the prescribing veterinarian. This extended withdrawal interval must be based on scientific information on the human food safety of the use of drug. 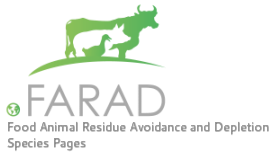 Veterinarians are able to contact FARAD for guidance in establishing this extended withdrawal interval. Compounding should be a last resort for treating food producing animals. Since compounding is considered extra label drug use (ELDU), all stipulations set forth by AMDUCA for ELDU must be followed. Compounding is discouraged in food producing animals since compounded drugs do not undergo the same quality assurance testing as commercially manufactured medications and the compatibility of the substances is often unknown. Additionally, pharmacokinetic data on compounded medications is lacking, making it difficult to estimate withdrawal intervals, and often, FARAD is unable to derive a scientifically based withdrawal interval.